One of the extras from sailing the Santa Cruz coast inside Monterey Bay is the ability to watch videos of yourself for a few days after the session. If you go to Surfline and then to their CAMS and choose Central Coast and then for your session either Jack's or 38th Avenue Overview you can view video of some of your session. The one I did the screen capture on was at 3:40 p.m. if I remember correctly. Windsurfed Natural Bridges today. Was thinking the wind was too light after rigging and the white caps went away and the trees stood still. Waited a while and then went as it seemed a bare breadth had a few leaves wiggling. Ended up having a great time as occasionally the wind would come up for and extended puff. Rode some swells that were head high +, although most were smaller and none were catchable in the lulls. The WF-WRF model predicted SW wind in the Soquel Cove of Monterey Bay so thought I would launch at New Brighton with my Sail/SUP and catch waves at Privates as the tide was low at 2:30 p.m. and would not be over 2 feet until about 6 p.m. When I was rigging it was only blowing about 8 knots, but I figured the wind would increase as I headed Southwest. The wind died. When I launched it was barely a knot. As a result, I got rejected a couple of times. Tacked out about a mile. The wind was increasing as I went. By the time I tacked and headed towards Bombora, it was up to nine knots. As I continued it continued to strengthen. Bombora had started to go off as I was rigging. So as I came into the break I caught a nice wave there. Went back out for more. Wind was now up into the teens and the sets seemed to queue up perfectly with each time I went out. Some sets had waves of shoulder height. With Bombora you can do rights or lefts or multiple rights and lefts on the face below the crest as it travels landward. It is an interesting wave. It was so good at Bombora, I never left. Never went further up the coast. Only headed in from there when finished. Nice day at Natural Bridges today. Good wind and some swell to play on. I was on my Sail-SUP 10' 2" and Ezzy 7.0. Overpowered on the outside. Another windsurfer was on a Fanatic with a 5-something sail. I put in 21 miles in a 2 hour session. So happy to be out on the water! Continuing the Crissy to Stick back and forth commute. Fri: weak day at Stick with Isonic 111 and 7.3. I get a good 45' with the wind opened up all the way to Sierra Point, but otherwise is stop and go. Sat: very nice day at Stick. Isonic 111+7.3 powered up with people out with 4.7-5.5. Amazing how easy is to sail overpowered with the Switchblade 7.3. Wind SUPped off of New Brighton State Beach on the pre-frontal winds which ranged from 6 to 20 knots. Windsurfed Bombora for the first half of the session. Break was sometimes overhead. Had one 400+ yard run on the best wave that I got there. Took me all of the way to Escalona Gulch. Windsurfed Toes Over for the second half of the session. Had some good rides there as well. Wind started getting really up and down as the front approached, so headed back without trying Bombora again. Need the wind to be reliable if going into that break. Fun day! dangerously low in the usual spots. The 4.7 was pretty much to much, do to gusts . and I think that is about right. It was South West all afternoon. 1 1/2 hour lone wolf session at Coyote Pt from 1 to 2:30 with the wind averaging 12-15 with some gusts. JP 135 foil board was paired with an old 5.3 Naish Force. The foil was up most of the time and had no problem going upwind against the flood tide. I glided into the west wind chop like a warm knife through butter..so easy on my old bones. So much for my plans to do more regular windsurfing.. I like your photos that you include sometimes with your posts. Helps understand the gear instantly rather than having to decipher an unfamiliar (to me) brand. 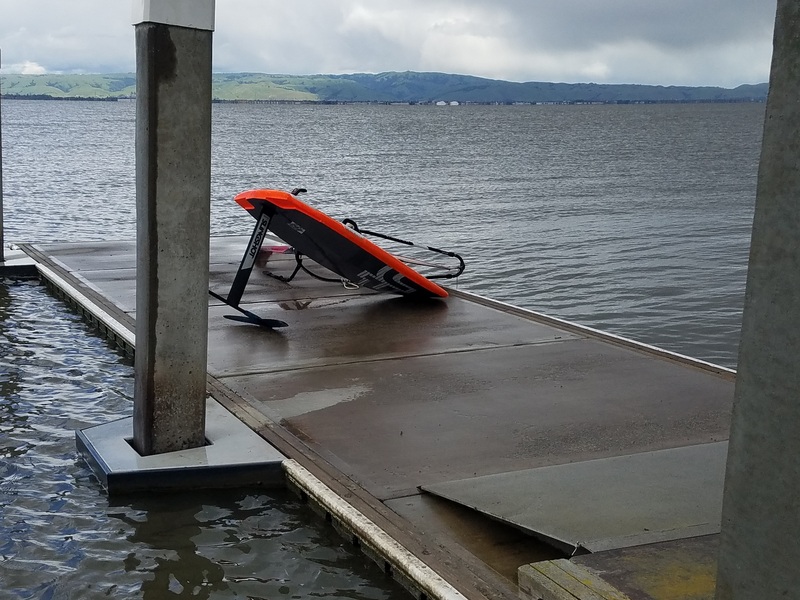 Question for you on your Palo Alto Monday post: Is there a new dock there on the Bay itself? I remember an old wooden one that you had to navigate out of a creek before reaching the Bay. One had to know how the creek ran by seeing it at low tide if they were really going to make it out without grounding. Of course some of the "MudDogs" could sail that mud without any water. So, is there a new dock there on the Bay? Certainly seems it would help foiling in that location. The dock sits on an inlet about 50 yards from the main body of the south bay. I can only foil when the tide is +5 ft. Been stuck in the mud 3 times already so I generally use a shorter ( 24 inch) mast there. They've refurbished the dock last fall, but it's the same dock location.